The CR & YR Series Needle Roller Bearings are recommended where running loads and shock loads are moderate. Bearing capacity of the CR Stud Type Series is limited by the moderately sized stud. 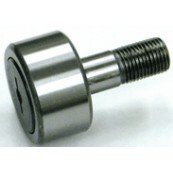 Manufactured from High-Alloy bearing quality steel. • Hex Drive or Screwdriver Slot (for the CR Stud Type) • Choice of Non-Crowned or Crowned Outer Race • Eccentric Bushing option for added positional alignment on stud versions • Sealed or Unsealed. Contact Us for your special quote.